A BATHROOM WITH A VIEW: there is only one way to wash away the stress and toxins of our technological world: going back to simplicity. Our recipe for full relaxation and well being is ONE BATH A DAY: as long as you do it surrounded by natural materials, in an aromatic mist of fresh fragrances and healing oils. Simple is Heaven for body and mind. You might enjoy a big car or spacious home: you will be surprised how pleasing can be to spend hours in a 3 square meter room. 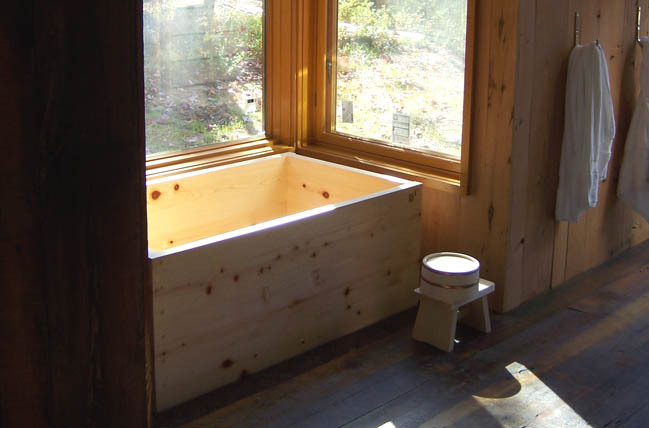 Even in a very compact 160x160cm bath-unit, where you can be completely surrounded by nature and soothing natural scents is enough to make the most of your relaxing time. You might read a book while soaking in the warm water or just enjoy a serene landscape out of the window, you will come out rejuvaneted, relaxed, healed. No doubt about it. You find it difficult to imagine? Please take a look at our introductory page. This miracle is called hinoki bath. 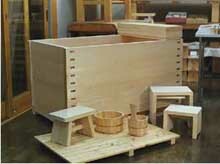 We are in contact with several craftsman in Japan who are producing hinoki bath-tubs for generations. ones. Bartok design offers you this option that is not normally on the market and definately not available to overseas customers. The reasulting bathtub is the one that matches your needs and taste.